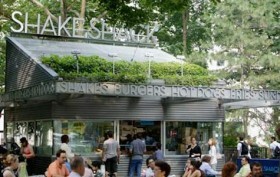 Shake Shack Flagship to Close for Five Months: Say it isn’t so! We’re guessing Danny Meyer truly believes that absence makes the heart grow fonder because Shake Shack’s mainstay at Madison Square Park is closing for 5 months for repair, according to the Observer. But before you panic, find out when. It might not be as bad as you think… okay it’s still bad. Made-in-Brooklyn Brands to Get Certified: Won’t the real Brooklyn brands please stand up, please stand up, please stand up? According to the NY Post, the Brooklyn Chamber of Commerce is initiating a Brooklyn Made certification program to separate the wannabes from the authentic. History Tribute Fence Celebrates Diversity: In an effort to soften the blow of the less-than-pretty on-going construction site at Essex Crossing, Laurene Leon Boym’s artwork was chosen to dress the fence. Bowery Boogie has more details, including some of the drawing’s names. How to Get to New York’s Nuclear Lake: Scouting NY takes us on a journey to a former nuclear research lab from the 1950s. And you just wait until you see the lake!